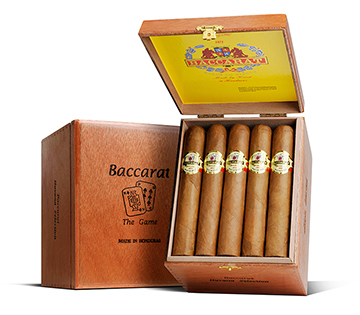 Baccarat 'The Game' cigars are handmade at Davidoff's Camacho factory in Danli, Honduras, and are very popular with new and seasoned cigar smokers alike as a terrific everyday smoke. Mild, flavorful, smooth and creamy, Baccarat cigars are blended with Havana-seed Honduran long filler tobaccos, Mexican binder, and finished in golden brown Connecticut wrapper leaf. Enjoy notes of coffee, cocoa, and toastiness perfectly balanced with the flavor of the sweet gum cap. Your palate and wallet will thank you.